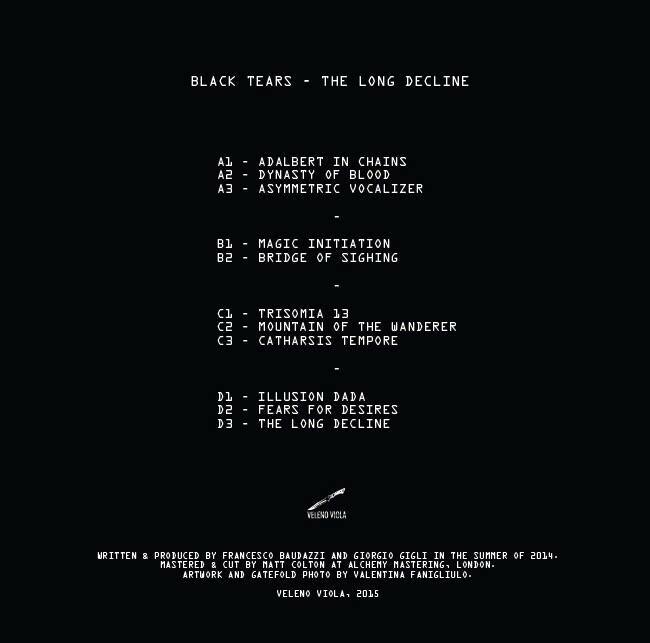 The Brvtalist is proud to present the first release by Italy's Black Tears. The new project by Violet Poison and Giorgio Gigli (Zooloft), Black Tears is the next step in the pair's progression. The project lies somewhere between cold, post Industrial, soundtrack and mutated techno and EBM. Violet Poison describes the material as "neoromantic nihilism". Music for a dystopian society where all aspects of life are controlled and love and lust are forbidden. People become robots and a false smile hides the real pain inside. We are excited to bring you the title track from the album, titled "The Long Decline". As always, the work of Violet Poison and Giorgio Gigli is complex, powerful and masterfully produced. The Long Decline is a glimpse inside this aforementioned world and the tracks are oozing with a dark, romantic atmosphere. The Long Decline is a journey to a bleak, desperate society that is both frightening yet all too familiar. The LP is out now and you can purchase from Juno, Ready Made and Hardwax with more outlets coming soon.